This book provides not only an understanding and appreciation of Georg von Albrecht’s musical art, but also links his compositional approach to a broader historical and theoretical context. The significance of the study lies in the discovery of a «missing historical link» in the evolution of principles that range from the pentatonic formations and modalities of folk music and polymodal combination to the more abstract realm of serial procedures. These principles often unfold in contexts based on complex metric/rhythmic formulizations. Albrecht, whose folkloristic activities and compositional inclinations invoke the creative spirit of Béla Bartók, is an exemplar of a composer who has synthesized traditional and contemporary elements from both Eastern and Western European sources. He was inspired by many cultures, his music imbued with Byzantine and ancient Greek elements, Hebrew folklore, and Gregorian elements, as well as the pentatonicism of Eastern Asia. Russian and Lithuanian folklore underlies virtually all of his works. 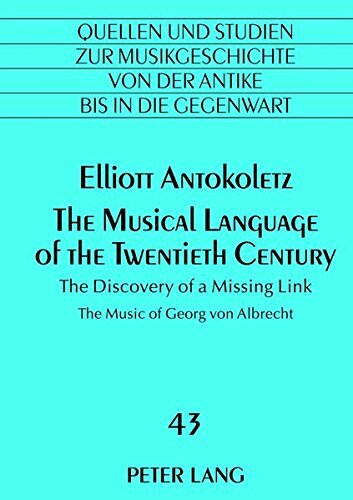 Albrecht’s profound reflections on music as well as the remarkable range of his compositional aesthetics and techniques still provide the music historian with a new level of insight into some essential links in the evolution of twentieth-century music and thought.